MADAM CHANCELLOR, UBC Law alumnus Marvin Storrow is an admired and visionary leader who has made remarkable contributions to the legal profession in Canada, to the legal community in British Columbia, and to the Faculty of Law at his university. A senior litigation counsel engaged in both civil and criminal law, Mr. Storrow has made almost 40 appearances before the Supreme Court of Canada. He was lead counsel on three cases judged by Canadian legal scholars as being among the most important cases in Canadian legal history on Aboriginal rights. His contributions were integral to numerous landmark cases involving the development of law in Aboriginal title rights and fiduciary duties of Aboriginal people. 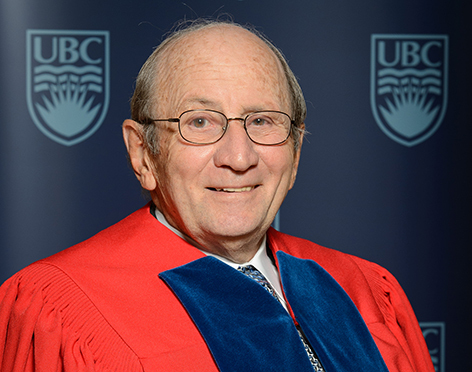 Mr. Storrow has been recognized with many prestigious awards, including the Georges A. Goyer, QC Memorial Award for Distinguished Service and the UBC Alumni Association’s Lifetime Achievement Award. Recently, he received the Law Society of BC Award, which honours exceptional lifetime contributions, as well as the Lexpert Zenith Award, which acknowledges lawyers from across Canada who have demonstrated leadership through innovation for 40 or more years. Mr. Storrow’s commitment to the legal community, however, extends beyond the courtroom. He served on the Board of Directors for the Justice Institute of British Columbia for 14 years, where he left a lasting legacy with the creation of a bursary to support Aboriginal students pursuing legal studies. He has been active in inspiring the next generation of legal leaders through the UBC Faculty of Law, where he established a scholarship for the student with the highest standing in the first year of the First Nations Legal Studies Program. He has also chaired numerous reunions for his Class of ‘62, enabling his classmates to reconnect with their university, and to engage directly with students. Madam Chancellor, in recognition his many contributions to the legal profession and its future leaders, I ask you to confer the degree Doctor of Laws, honoris causa, upon MARVIN R.V. STORROW.